Welcome to Senators’ Weekly, where you can catch up on the past week of the Ottawa Senators throughout the 2018-19 season. From trending topics to surging prospects to news and notes, this is your weekly roundup on all things Sens. The Senators entered the week on an eight-game losing streak, looking to change their trend on their trip to California. They faced off against the Anaheim Ducks first, who, ironically, also entered the game on an eight-game losing streak. It took four frames, but the Senators came out on top with Colin White scoring the overtime winner. The Sens didn’t stop there, as they defeated the Los Angeles Kings 4-1 the next night. To end the trip, the Senators fell to Erik Karlsson and the San Jose Sharks 4-1. The club is now 17-24-5, sit at the bottom of the Atlantic Division, second-to-last in the Eastern Conference and third-last in the NHL. They are currently 13 points out of a playoff spot, which looks to be out of reach for Ottawa now. Here are the notable headlines and stories from the past week. With the trade deadline six weeks away, the focus of Senators media will largely be around the status of pending free agents Matt Duchene and Mark Stone from now until the Feb. 25 trade deadline. Both are elite players and could remain the core of the rebuilding Senators or could be making a push for the Stanley Cup with another team in just a short time. Duchene missed two games this week for the birth of his first child. 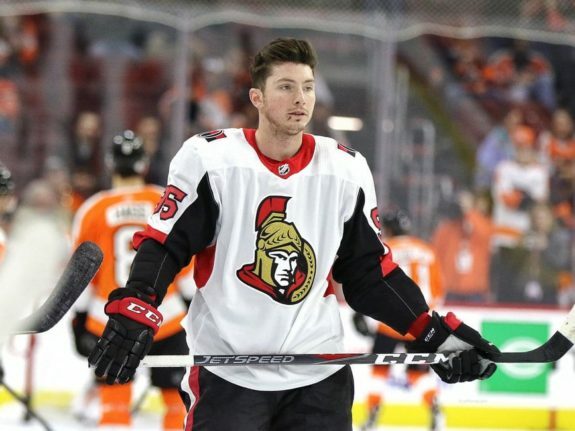 Speaking on Ottawa’s TSN 1200, Bob McKenzie reported that the Senators and Duchene’s camp will be meeting in the next week to 10 days. Duchene has 18 goals and 42 points in 37 games so far this season, good for second on the team behind Mark Stone’s 20 goals and 48 points in 46 games this season. Another TSN Insider, Darren Dreger, reported on ‘The Drive’ that Stone’s looking at a hefty raise from his current one-year, $7.35 million deal signed just before arbitration this past offseason. He noted that Stone could be looking at a contract “north of $9 million AAV.” Along the same lines, McKenzie discussed that the Senators are aware that they will need to overpay Duchene and Stone if they are to keep both. For an organization that has seen an enormous amount of animosity from fans over the past two seasons, getting Duchene and Stone signed to long-term deals would be a great step in the right direction. Even getting one of them signed would be promising. Otherwise, the team will need to look to move one or both players ahead of the deadline or risk losing them for nothing. Ceci on the Trade Block? While Duchene and Stone have the media focus, TSN’s Bob McKenzie reports that another core member of the Senators may be on the way out prior to the deadline. 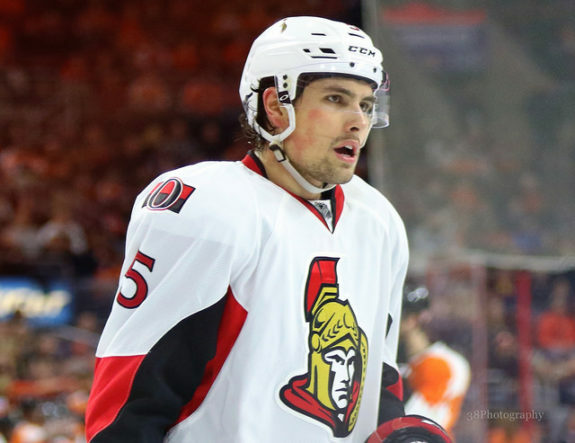 Speaking on Ottawa’s TSN 1200, the status of Cody Ceci, a pending restricted free agent, was discussed. “I think in the case of Ceci because he’s on the one-year deal…RFA at the end of this year – I think that the notion of trading Cody Ceci is within the realm of possibility,” allowed McKenzie. “And that it wouldn’t surprise me if the Senators have gotten calls on Ceci, and it wouldn’t surprise me if the Ottawa Senators are earnestly listening on those. This past summer, Ceci was awarded a one year, $4.3 million deal by an arbitrator. So far this season, Ceci has five goals and 12 points through 42 games, is a minus-20 and is second on the team in average time on ice with 22:44. The Senators completed two trades this week, both minor league transactions. They sent Gabriel Gagne to the Toronto Maple Leafs in exchange for forward Morgan Kilmchuk and Paul Carey to the Boston Bruins for defender Cody Goloubef. Gagne had a great season last year with the Belleville Senators and led the team in goals with 20. This season, he didn’t progress how the Senators hoped, collecting only nine points in 33 games. General manager Pierre Dorion traded up for Gagne in the 2015 Entry Draft, parting with a second and third for a chance to draft the forward. With the Senators rebuilding, all assets need to be examined to determine if they will be a part of the future. Gagne was not a part of that. Klimchuk was a first-round pick back in 2013 and has a World Junior gold medal to his name. In his 30 games prior to joining Belleville, the 23-year-old had just 10 points. The left winger was traded to Toronto just two months ago by the Calgary Flames. The trade seems like an attempt for both Gagne and Kilmchuk to get back on track with their developments. Both players have the potential to crack the NHL, so as it stands the trade seems fairly even. Carey on the other hand was nearly at a point-per-game pace, with 27 points in 29 games for Belleville. He was even called up for five games with Ottawa, although didn’t register a point. Carey signed a one year, $700,000 deal this offseason and the team may have felt they weren’t going to re-sign him. The team felt that they needed to bolster their defence though, and Goloubef is a good addition for that purpose. Goloubef may be best known as a member of the bronze medalist Team Canada at the 2018 Olympic Games. With Christian Wolanin looking like he may stick with the Senators in the NHL for a while, Belleville needed another defender. Goloubef was having a solid season, with three goals and 12 points in 16 games with the Providence Bruins. The Senators hope he can maintain that production. He will likely remain in the AHL though. At 29 years old, he has yet to prove he can play in the NHL. He’s played in 129 NHL games over six seasons, collecting two goals and 23 points. With Belleville trying to make a push for the playoffs, the team seems to be trying to push the team over the hump.